Michonne visits the area where her and everyone else last seen Rick Grimes as they still think that he is dead. She has a great monologue about how they are pushing forward for the last few years. We are also shown Daryl as he is fishing and living by himself in the woods. Also to add, Carol and Ezekiel are full fledged married and she even has longer hair now. When Michonne leaves the area, she sees the bridge as we found out that it was never rebuilt since the explosion. Michonne is also the new leader of Alexandria as she has toughened up to not let any new survivors in at all. But that will soon change. Carol has also changed in the last six years as she is much more bold and stronger now than ever and I believe that is what love does for you. She takes Henry (who is now a teenager) to the Hilltop so that he can learn how to craft items as a blacksmith. During the trip, they run into a few Saviors and who would have think that they were still the bad guys six years later. I also wished that there was an explanation on the fallout of the riot before the time jump but that might happen in a few more episodes. Regina and Jed of The Saviors has robbed Carol and Henry and they also took Carol’s wedding ring and Henry was shocked to see that Carol just let them do that. She later tracks down the Savior that took her ring and burned him and the rest alive. That was pretty dark and it reminded me of when Carol burned those Saviors alive way back in Season 6. There were also scenes of Rosita and Gabriel as Gabriel wants to try to communicate with other survivors via the radio. This was an interesting twist from the comics since Eugene is the one to do that in the comics. When they realize that the signal is very weak, Rosita and Eugene heads to the water tower to place an amplifier to boost the signal. But the trip back will have a shocking discovery with them but more on that towards the end of my review. Also, can we have Gabesita trending because Gabriel and Rosita are now a couple. Judith Grimes brings Magna and the rest of her group to Alexandria as she also pleads with Michonne to let them stay. Gabriel and the counsel which includes Aaron, Michonne, and others also interviewed all of them and asked them questions about what they were doing before the apocalypse and who they are as a person now. This scene mirrored the one in the comics as Rick Grimes was the one to ask them the questions. 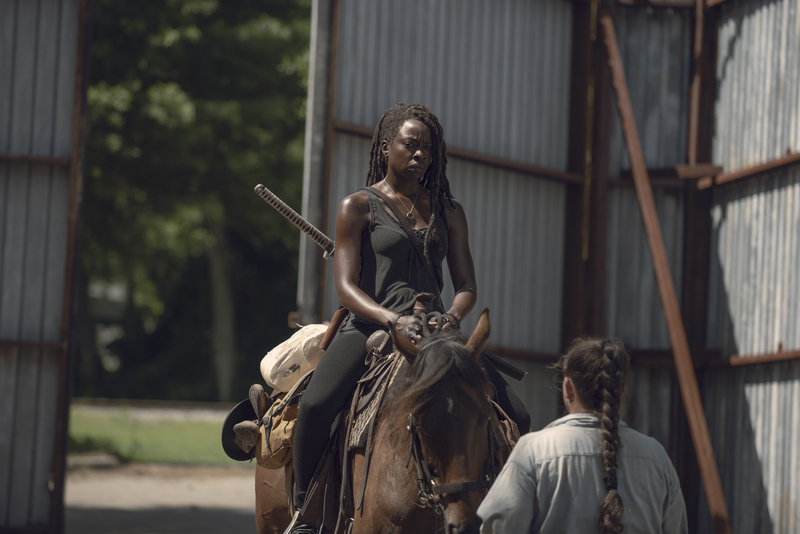 Michonne does not fully trust Magna since she lied about her background as she notices a prison tattoo and a knife in her belt (can I also note that Magna has a knife everywhere she goes because she had a few more after this scene). Michonne wants to take them all to the Hilltop. We also find out that Michonne has a son so this must mean that she was pregnant before the time jump. Imagine if Rick comes back from wherever the helicopter took him to find out that he has another son? We get a nice scene with Negan helping Judith with her homework and he is still in the cell. Negan tried to play a mind game on her to reveal who the new people are but Judith was smart enough to know to not buy into his tricks at all. I would like to see more scenes with these two. The episode ends as Eugene and Rosita tries to camouflage themselves from a zombie herd. But the shocker is straight out of issue #130 of the comics as some of the “zombies” were whispering asking where were the two that they just seen. 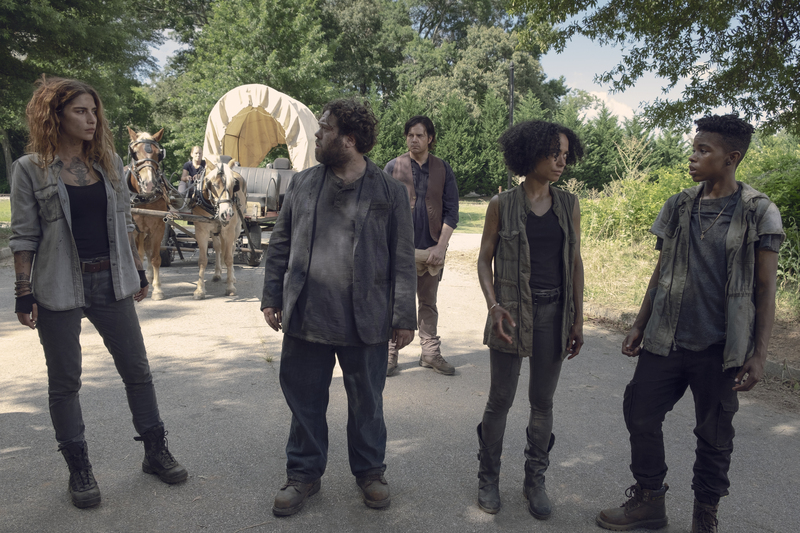 Eugene and Rosita were shocked to hear this as this is the first appearance of The Whisperers! This episode moved up the pace from last week’s episode but there are two questions that rings into my head. What was the fallout of that camp riot with The Saviors and where is Maggie and how will her disappearance be explained for the rest of the season? Other than those two questions, this was a great episode that not only dealt with the emotions of the three characters that were tied to Rick Grimes the most, but it gives us more exciting story lines to look forward to especially now since The Whisperers are now here. There are two more episodes left for the first half of Season 9 and we are just getting started.